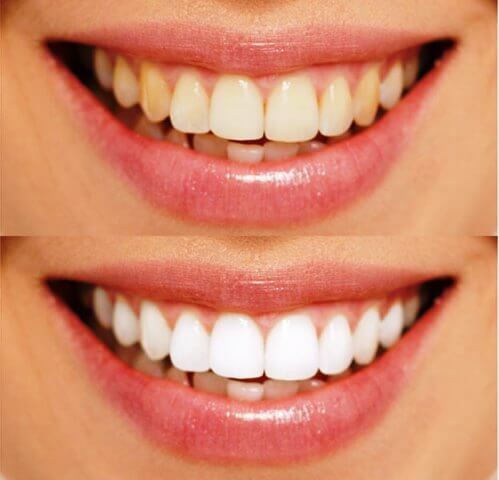 Our system will remove most stains with a gentle LED bleaching action that whitens your teeth. As the active ingredients in the gel (carbamide & hydrogen peroxide), are broken down, heat, oxygen, and light acts upon the stained organic deposits, which oxidizes them into a whiter color. This process makes the overall tooth color closer to its natural unstained color while your tooth structure remains unchanged. Years of clinical tests have demonstrated the safety and effectiveness of this system. Over 95% of customers treated with this system achieve some level of tooth whitening. This procedure may or may not require additional whitening in order to achieve the desired lightened shade. The amount of whitening varies from client to client and cannot be predicted or guaranteed; but in general use, teeth may lighten anywhere from 6 to 12 shades on the whitening shade guide. The results depend greatly on how discolored the teeth were original. Yellow or brown teeth, surface stains, and uniformly darkened teeth are easiest to whiten. Additional whitening treatments may be needed in order to achieve the desired shade, especially with heavily stained teeth. Yes, Laser Light’s FDA approved-for-market Beaming White whitening light and gel ingredients are safe and effective for cosmetic teeth whitening. With the strongest gel on today’s market. The dental industry has used this same technology and gel products for many years. This process does not change or damage the structure of the teeth, it just makes them appear whiter and brighter. Most client experience no pain or sensitivity from the treatment. A very small percentage of clients experience some slight tingling sensations. We advise avoiding very hot or very cold drinks if tooth sensitivity does occur. If tooth sensitivity develops, fluoride home care gel can be recommended for reducing sensitivity. In the unlikelihood that sensitive persists for more then two days, we will recommend that you contact your dentist to check to see if there is an underlining issue. We also recommend that you visit your dental office regularly. Lastly, the bleaching gel, can come in contact with the gums, can cause temporary inflammation and white spots. This should resolve itself within a few hours. Yes and no, The process was designed to enhance the natural whiteness of the enamel, but clients do claim that it also brightens up veneers and dentures. Clients typically apply the gel product only to their natural teeth, allowing these treated teeth to lighten up to match a cap, crown, or veneer. The most common type of vital tooth whitening uses a gel that is applied directly to the tooth surface. This product contains hydrogen peroxide. In-office whitening allows your technician to use a more powerful whitening gel than take-home products. A specialized light or laser activates the gel and allows bleaching to happen faster. In-office whitening usually takes 30 to 60 minutes. You will need 1 to 2 appointments depending on how severe your stains are and how white you want your teeth to be. Different types of stains respond differently to the treatment. Next, the technician will clean your teeth. This will remove the film of bacteria, food and other substances that build up on your teeth and contribute to the staining. Once this is done, the whitening procedure begins. First, your technician will apply a substance that covers and protects the gums around the teeth. Then, the whitening agent will be placed on the teeth. After the whitening agent is applied, the technician will shine the light on your teeth for 30 to 60 minutes. If they are badly discolored, your technician may suggest that you continue the bleaching process at home for a few days. We recommend that pregnant and nursing mothers, children under the age of 14, diabetics and those with pre-existing medical or periodontal problems consult their physician/dentist prior to undergoing any whitening procedure. Consumers with severely tetracycline stained teeth may choose bonding and veneers as the best option. Tetracycline stain cannot be removed (Antibiotic abuse). Remember, teeth cannot be bleached whiter than genetically possible. Sometimes after whitening treatments, teeth can be sensitive for 1 to 2 days. If this occurs you have options to reduce the pain. Part of the gum line may turn white if extra bleaching gel comes in contact with these softer tissue areas. The peroxide component will bubble and turn white. This is a common occurrence in the dental industry known as “blanching.” The affected areas should return to normal in 30 to 60 minutes. Rubbing vitamin E on these areas will help relieve any sensitive issues and return the natural color of the gums. These bright white streaks are caused by the calcium deposits embedded in the teeth. This will subside to normal over the next 48 hours or sooner.